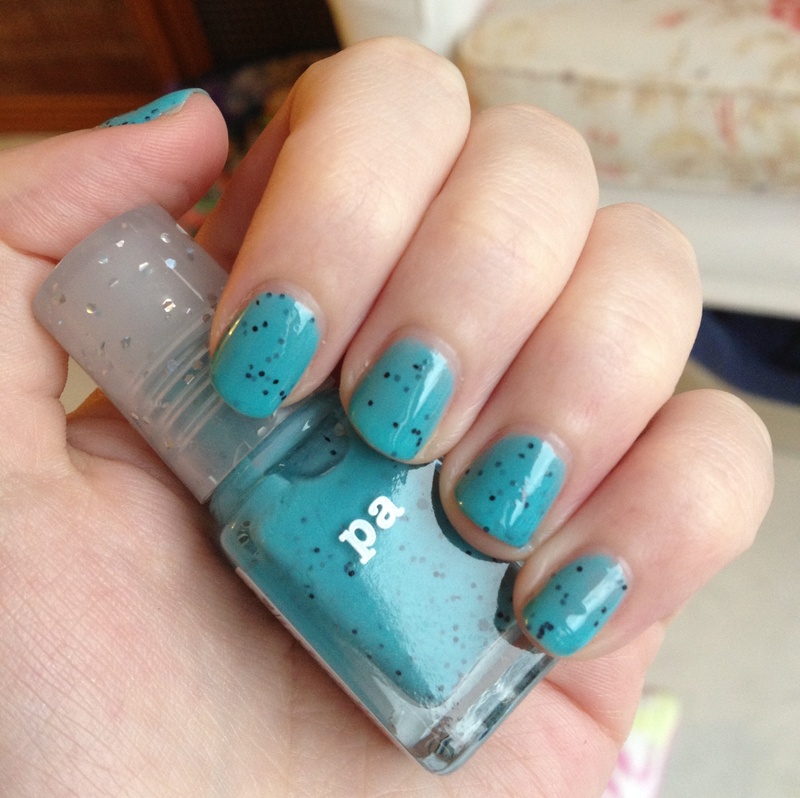 AA62 is a muted turquoise jelly base speckled with matte black glitter and bigger matte black hex glitter. You guys know I love turquoise so it’s unsurprising that this was a case of total unadulterated love at first sight! The shade of turquoise is absolutely GORGEOUS; it’s a slightly more muted, darker teal rather than a zinging aqua but it’s still bright and beautiful, even more so thanks to the super shiny, squishy jelly finish. Ahhhh… so squishy I wanna die! Whilst the small black glitter is dispersed well throughout the polish and spreads easily onto the nail, the bigger pieces are pretty impossible to fish out (you can see some hiding in the bottle itself in the photos). Personally, I’m not too fussed about this as it looks stunning as it is – but maybe it would look even more stunning with the occasional big piece?! I guess we’ll never know! Otherwise, AA62 is really easy to use. It’s opaque in two coats and dries to a shiny glossy finish, that’s pretty smooth even with the peeps of glitter. pa’s brush is small but easy to control and spreads the polish well. Simple as that! The only problem with AA62? Given the doll-sized bottle, you may need to buy several back-ups if you get as addicted to it as I have! It’s like a slushie studded with strawberry seeds – and as weird a combo as that sounds, I just can’t get enough of the stuff. This entry was posted in Beauty and tagged Beauty, best glitter nail polishes, cosmetics, Dear Laura, Japanese nail polish, jelly, make-up, nail lacquer, nail polish, nail varnish, pa, pa nail polish, review, swatches, turquoise. Bookmark the permalink.